Joan Marie Verba earned a bachelor of physics degree from the University of Minnesota and attended the graduate school of astronomy at Indiana University, where she was an associate instructor of astronomy for one year. She has worked as a computer programmer, and health-weight loss coach. She currently works as a writer, an editor/publisher and a social media manager and mobile marketing consultant. An experienced writer, Joan is the author of the nonfiction books Voyager: Exploring the Outer Planets, Boldly Writing and Weight Loss Success!, as well as the novels Countdown to Action!, Action Alert!, Deadly Danger!, Situation: Critical!, Extreme Hazard!, and Danger Zone! plus numerous short stories and articles. She is a member of the Science Fiction and Fantasy Writers of America, the Society of Children’s Book Writers and Illustrators, and The International Association of Media Tie-In Writers. 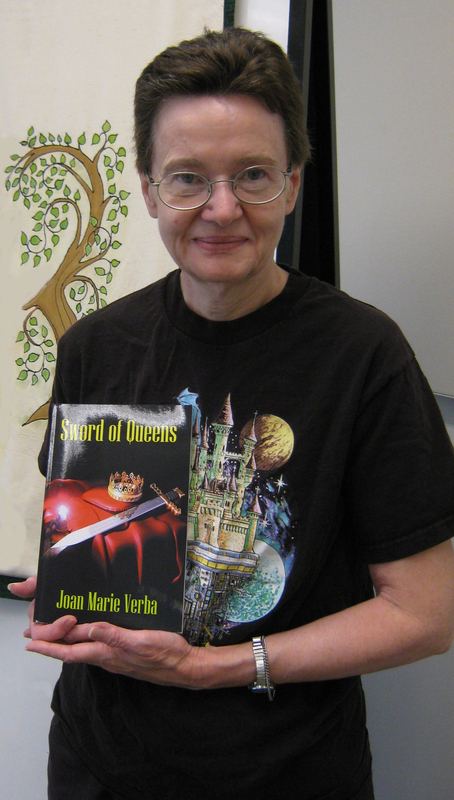 She has served on the board of directors of both the Minnesota Science Fiction Society and the Mythopoeic Society. Joan is a proud member of the National Weight Control Registry. This is a registry of people who have lost at least 30 pounds and have kept it off for at least a year. Read My Weight Loss Story. Read my weight loss site, which contains all sorts of weight loss tips.